This entry was posted in Canada Immigration and tagged Canada family based immigration Canada Family Class Visa Canada Family Sponsorship Canada Family Visa on June 1, 2016 by Blog Author. The Canada Government strongly encourages family reunification which has paved the path for Canada Family Immigration. The Canadian citizens and permanent residents over 18 years can sponsor their dependent under Canada Family Immigration class. The Canada Family Immigration allows certain dependent including spouse, conjugal or common-law partner, dependent child/adopted a child and other eligible relatives to immigrate to Canada. Under Canada Family Immigration, if the dependent are entitled with permanent residency then they can study, reside and work upon immigration to Canada. The following are the different types of Canada Family Immigration through which you can sponsor your family members for immigration to Canada. If you are a Canadian citizen or permanent resident who would like to sponsor your partner or conjugal partner or dependent, then you must submit a proof stating that you can support yourself and your family members upon immigration to Canada. But, the dependent must satisfy medical, criminal and background requirements. Under Parent and Grandparent Sponsorship of Canada Family Immigration, the citizens or permanent residents of Canada can sponsor for parent or grandparent to immigrate to Canada. 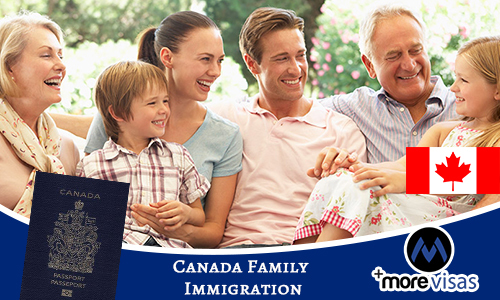 You must financially support your parent or grandparent upon immigration to Canada. Parent and Grandparent Super Visa is another pathway which allows parents and grandparents to stay up to a period of two years without renewal and is valid for 10 years. Under Dependent Sponsorship of Canada Family Immigration, the eligible citizens and residents of Canada can sponsor dependent or adopted children to immigrate to Canada. You can also sponsor brothers, nephews, grandchildren, sisters and nieces under the age of 18 years and who do not have a partner or conjugal partner. In order to sponsor you must meet set income guidelines and must be able to financially support your dependent upon immigration to Canada.